The Deal: Bikes are available. Warning: Order now for the best price and selection. May be $100+ more later this year. The Process: When you order, your card will be billed for the full amount. You will then get an auto-email the next business day. For example a Fri/Sat/Sunday orders get emails on Monday. Weekends/Holidays are not counted as "days". Your Shipping Address: Please ensure your shipping address is correct when you place your order. Last minute address changes will incur delays and/or extra costs. Your shipping address can be changed on the 3rd page of checkout by clicking on "change" beside the address. "Fuji bikes produces a variety of hybrid bikes for performance, commuting and the trail. The Sunfire 2 is their latest trail hybrid... Its Suntour fork provides 63 mm of travel, which can be locked out for riding on smooth surfaces. 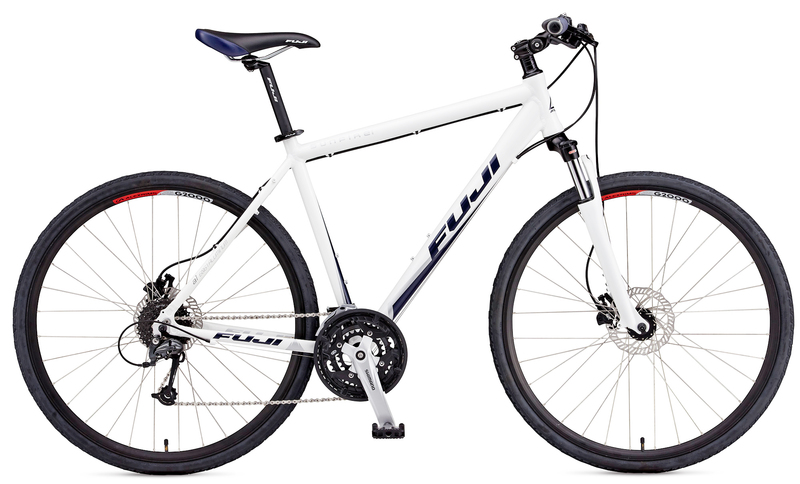 Shimano derailleurs, shifters and crankset, versatile tires and an aluminum frame make this bike a high quality, fast adventure hybrid. It earned 4 out of 5 stars on Roadbikereview.com." "Frame: Construction that's a cut above the usual fare ...looks like it’d be at home on a somewhat more expensive bike"
15 fits most riders 5'4" to 5'6"
17 fits most riders 5'7" to 5'8"
19 fits most riders 5'9" to 5'11"
20.5 fits most riders 6' to 6'2"
22 fits most riders 6'2" to 6'3"
Best way to pick your size - choose the one within your height range.